Fleischmann’s has a long and storied history in the US spirits industry, including making the first American-made Gin in 1870. 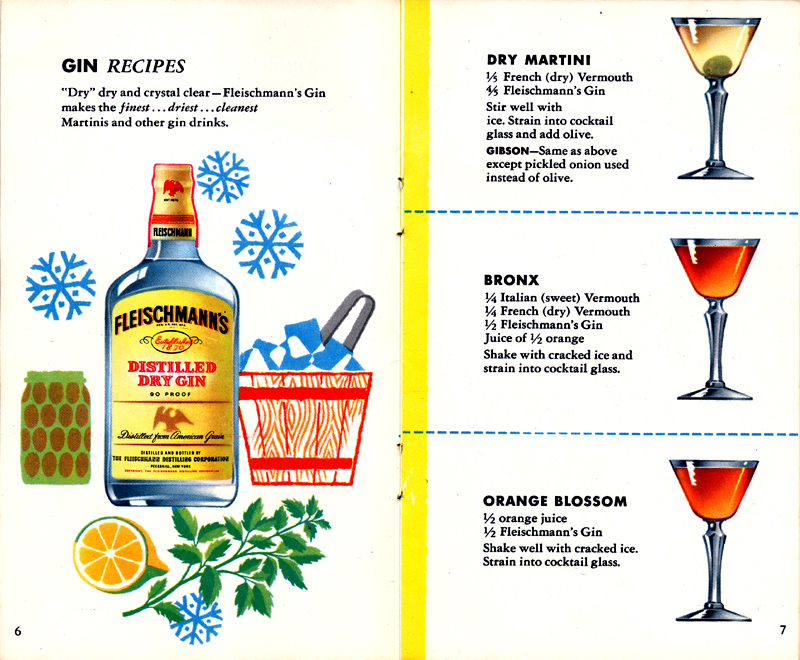 Fleischmann’s Mixer’s Manual was distributed by Fleischmann’s in the mid-50s. It features the expected mix of cocktail recipes featuring various Fleischmann’s brands of whiskey, gin, scotch, bourbon and rum, but it also holds an unexpected and amazing artistic secret. See below to unravel the mystery. At first glance, Fleishmann’s Mixer’s Manual, printed sometime in the mid-50s doesn’t make a huge impression. From its small size (about 6” x 3.5”), to its basic use of color to its simple illustrations, it doesn’t immediately stand out. But take a closer look. 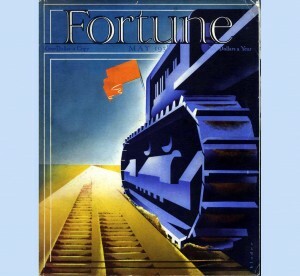 The small size is a given, but the use of color has a zen-like aspect of message and purpose and the design has a mesmerizing. crisp simplicity that is clearly not the work of some art-department hack. 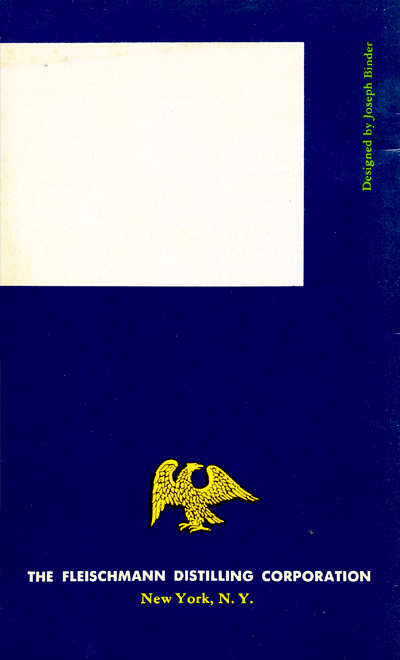 On closer examination, a single line of serif type, almost hidden on the back cover solves the artistic mystery. Don’t know the name? You probably know his work. If you don’t, you’ll thank us for the introduction. Joseph Binder was an Austrian illustrator who left his stamp on American and European design in the middle part of the 20th Century. 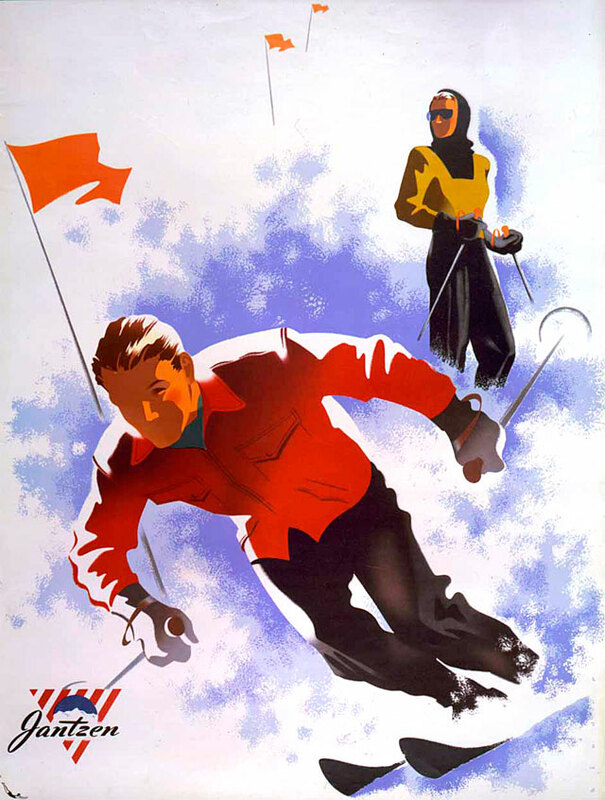 Heavily influenced by cubism and De Stijl, Binder created the visual lexicon of mid-century modern design: clean and streamlined with bold use of color and a geometric abstraction of the subject. Inside, the design remains crisp, but we get down to the serious business of mixing drinks with similar “Hints for the home bar” that you’ll see in a lot of pamphlets on TheVodkaParty. And the reason is, they make good sense…and great cocktails. To our regular readers, I’ll skip the shaken-not-stirred Bond joke this time. My favorite: “A mixed drink Is never better than the liquor brand used.” Wise words that could apply to anything in life as long as you were willing to swap out “mixed drink” and “liquor brand” for whatever point you want to make. 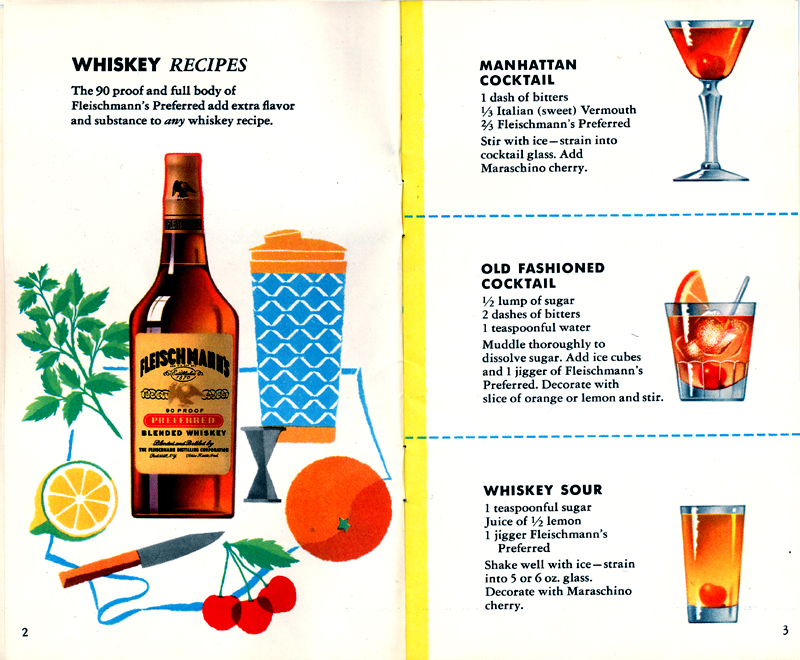 The first of four pages of Whiskey Recipes leads the way with more great design and classic cocktails including Manhattan, Old Fashioned and Whiskey Sour. “Ward 8” is sort of like a Whiskey Sour with Grenadine. Its origins are hidden in the dark mists of history; one story traces it to Boston, 1898 where liberal distribution of this fine cocktail resulted in a liberal candidate’s election in a State Senate race. Other creation myths set its origin in NYC (which doesn’t have a Ward 8 ) and DC (which does). 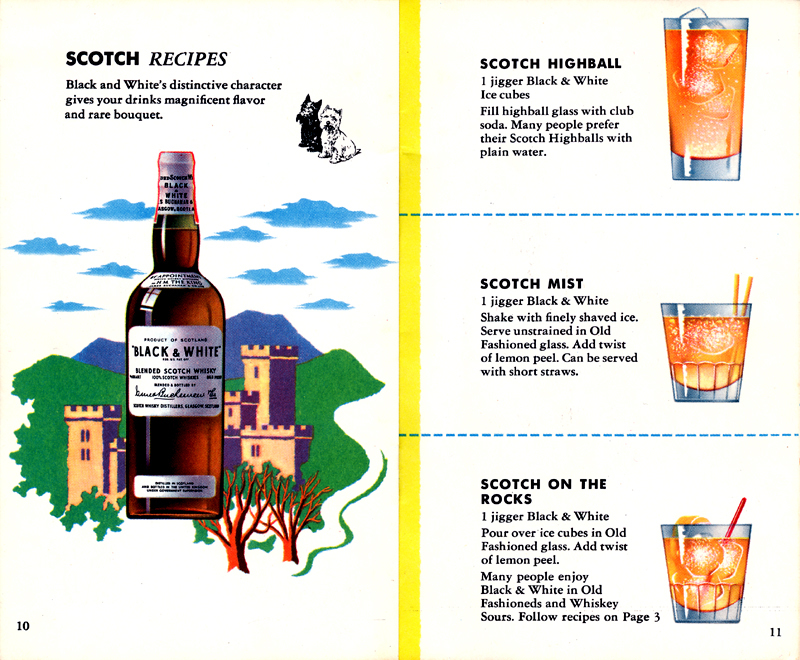 It’s also said to be the drink of choice of the fierce Scottish Guards in Her Majesty’s army (I somehow can’t see those rough and tumble Highlanders marching into battle to the harsh braying of “the pipes,” fueled by a shaken-not-stirred fruity whisky cocktail). In any case, all of these origin tales come from Wikipedia, so it would probably have been easier and no less accurate had I just made up some stories on my own. You’ll also find a “Whiskey Flip.” “Flips” are mixed drinks that feature egg as the key non-alcohol ingredient. A rigorous shaking results in a frothy, boozy treat. 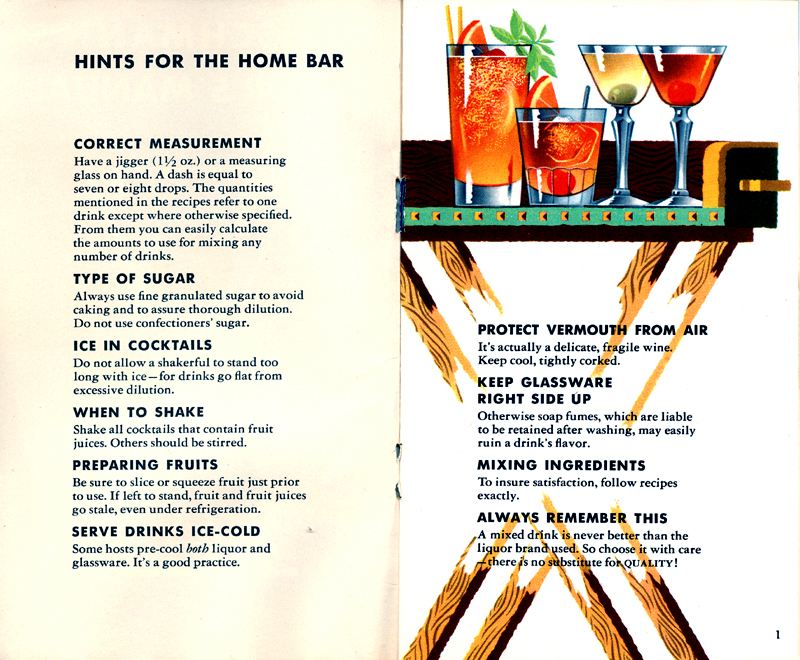 Flips are found in a number of vintage cocktail guides, but seem to have fallen out of favor, perhaps due to our better understanding of salmonella. Somehow I imagine the kids chewing on wax lips in the den as pop mixes up a flip in the parlor. 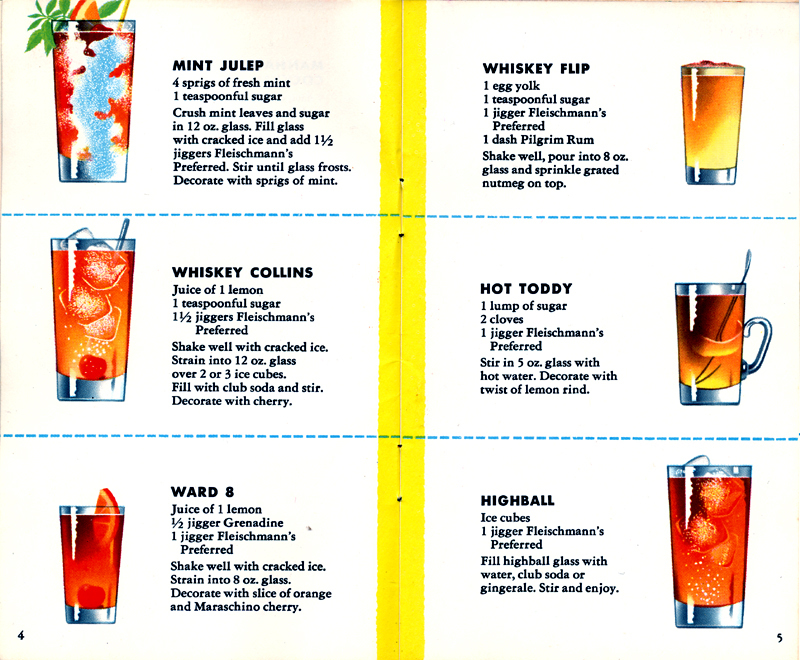 Drinks include: Mint Julep, Whiskey Collins, Ward 8, Whiskey Flip, Hot Toddy and the ubiquitous Highball. 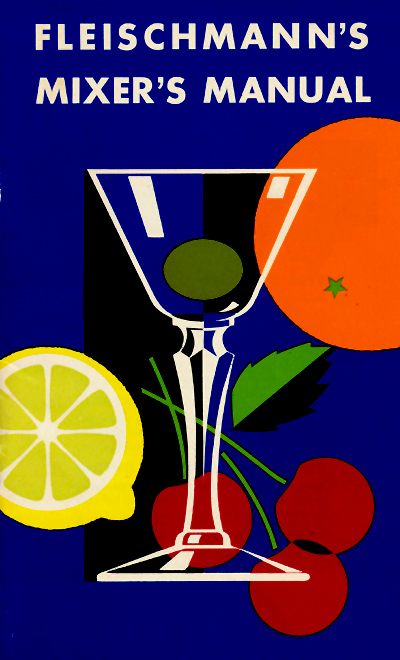 Gin Recipes introduced with more smooth Binder design. I especially love the ice bucket. Note the blue dotted lines. You could conceivably cut this booklet up into recipe cards for easy access at the bar. You could also paint a mustache on the Mona Lisa. I don’t recommend either, especially cutting up Fleishmann’s Mixer’s Manual. 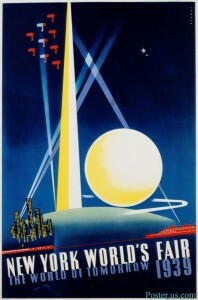 Drinks include Dry Martini, Bronx, Orange Blossom. Cool and refreshing Gin drinks continue. 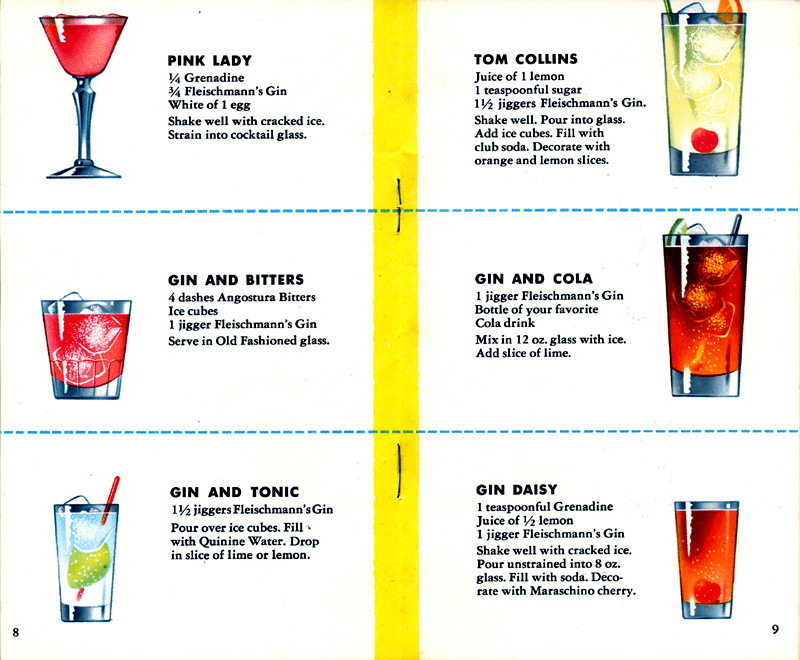 I haven’t seen a Gin and Cola anywhere else, but I guess they had to fill all six spots on the page. The G&T recipe here may be historically accurate, but here’s my favorite G&T recipe from erudite cocktail blogger Conrad Banks (see the right hand column towards the bottom). Drinks include Pink Lady, Gin and Bitters, Gin and Tonic, Tom Collins, Gin and Cola and Gin Daisy (which is what I blurt out when I hit my thumb with a hammer). Some well-rendered and brand appropriate Scotty and Westy artwork intrudes into the cool Binder mood of this page, with the bottle of Black & White scotch standing strong above a stalwart Highland castle. Drinks include Scottish Highball, Scotch Mist and Scotch on the Rocks. Hootman! Churchill “88” Bourbon, which doesn’t have an recipes of its own, but can be substituted into recipes on pages 3.4.5 and 11, but never pages 6.7.8.9 or 10. Never. Pilgrim Rum is the liquor of choice for Planter’s Punch or Cuba Libre. 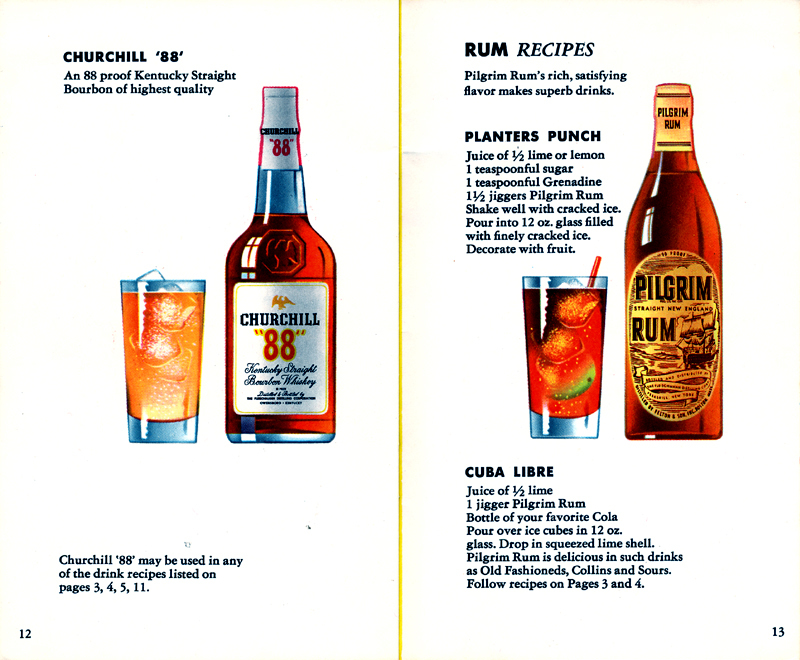 Neither Churchill “88” nor Pilgrim Rum seem to be in current production. 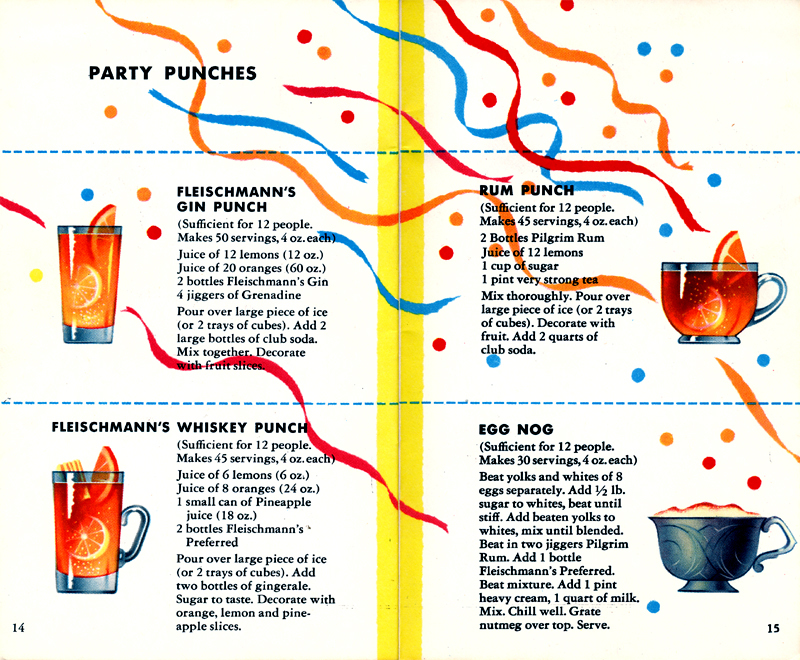 Drinks include Fleischmann’s Gin Punch, Fleischmann’s Whiskey Punch, Rum Punch and Egg Nog. 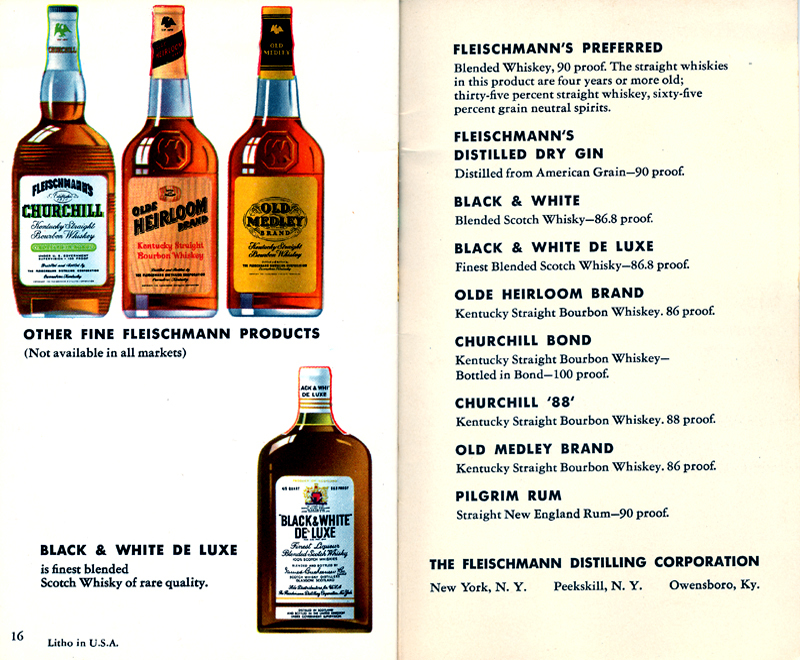 We end with a laundry list of “Other Fine Fleischmann’s Products.” Not much of interest here. Note the white box for the local liquor store to stamp their address and (less than 7 digit) phone number. And of course the subtle credit line that unlocked the marvelous mystery of Joseph Binder and Fleischmann’s Mixer’s Manual.